World Wide Knit In Public Day 2016 and dziergadanie prawelewe KIP are joined events this year, and take place under the OCTOPUS FOR A PREEMIE project umbrella. This is a world-wide project focused on making squishy octopus toys for premature babies. The tentacles of the octos are meant to resemble the umbilical cord and to remind the babies of their time in the womb. The concept was born in 2013 in Denmark. More about the original idea is to be found here (in Danish) and here (in English). 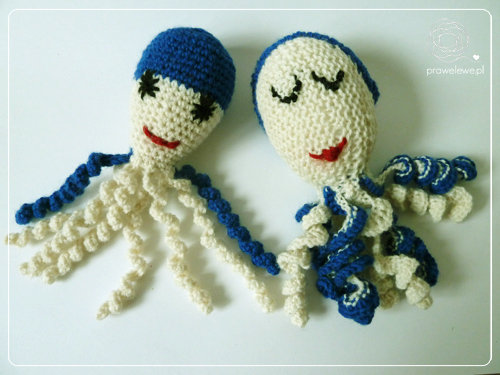 Making octos for preemies has spread around since and there are many countries where people make and donate their octopus toys to local hospitals. There is a group of Polish volunteers, who coordinate this project in Poland, too (their page is here). Myself and my friend-Irishmagda have decided to support this idea both for Polish and Irish babies, and for anyone who wishes to take advantage of our versions of the instructions and make octos for any preemie. 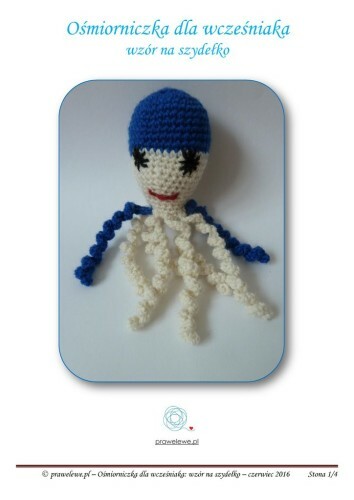 Based on the original Danish instructions, we have prepared our own version of the patterns for crochet and knitted Octopus, both in Polish and English (UK and US terms). 18th June 2016 is the WWKIP Day so prawelewe and a Wrocław’s LYS-Makeland have joined for a great cause. We meet with our friends, customers, fans and new people to knit and crochet octopus toys, and then donate them for premature babies in hospitals in Wrocław, Poland. 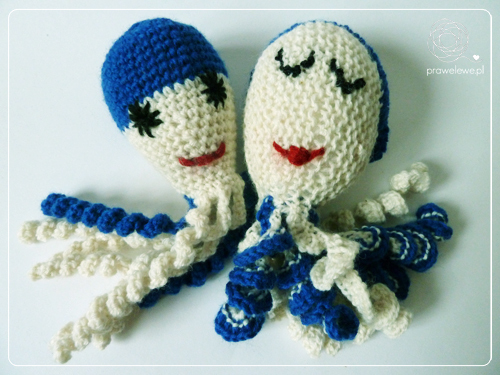 There are two techniques you can use to make your octos: crochet (will look similar to the octo on the left in the picture) and knitting (will look somewhat like the one on the right in the picture). There are certain rules for making your octopus toys so they could be given to premature babies, and all are described in the patters (those are also available on the Danish page, Polish project’s page and surely any other coordinators group’s page you will find) but not so many, and all of them are because the octopus toys are to be healthy, helpful and forever for every baby who receives it. Our dziergadanie prawelewe KIP + WWKiP Day 2016 have their special FB event here. There is also an event on the official World Wide Knit In Public Day page. You are all welcome to join us, regardless of your level of expertise in knitting or crochet. Although the WWKiP Day and our 62. dziergadanie prawelewe KIP is a one-day event, this project participation is by no means to end the same day. There is a plan to bring this idea to Ireland- one of our Ravelry prawelewe group friends wants to spread the news there so the patterns published on the prawelewe page are for everybody who wants to get involved. Enjoy! Please note that there might be slight differences in requirements given by coordinators in different countries. It simply depends on the agreement the people who run the project make with the representatives of the local hospitals. Please make sure that you work your octopus toys exactly the way it is described by the people who will collect your work from you, otherwise your octos might not reach the babies. If you grab one or more of them for yourself, please leave a comment below this post to share with all of us that you are involved. NOTE: English patterns have been slightly updated; the current version is 20-06-2016. Please make sure to work with the newest version of these files. If you download the pattern, please leave your comment under this post- let us spread the news! This entry was posted in crocheting, dziergadanie KIPs, KALs & CALs, knitting, patterns, tutorials. Bookmark the permalink. These look so cute, can’t wait to try them out , will make a change from hats, jackets and blankets for my local unit that I usually knit. we have just caught up with this idea in New Zealand. I am giung tosart making some for my local hospital.